With an epic in scope aura seemingly sculpted from the Viking years of a battletorn Bathory, Germany’s Finsterforst got my attention with this very open and vibrant sounding release. Rastlos feels as spacious and mighty as the cover art would depict, allowing the listener to place him/herself atop a cliff staring down upon the mist laden valley below. I love it when music can remove my brain from this reality and unleash my thoughts into woodsier environs, and Finsterforst effortlessly achieve this with song structures that allow a lot of room for simplistic melodies, synth work and choir accompaniment to soar above other folk inspired and often mundane bands often found polluting this genre. 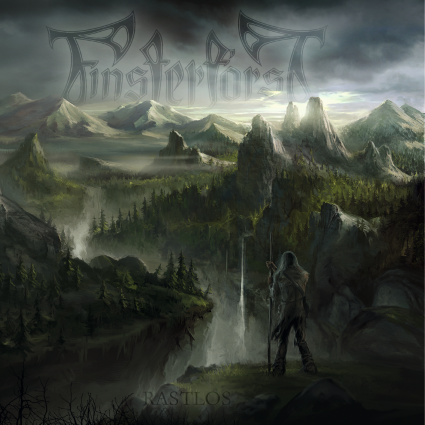 The obvious Bathory influence is going to get me every time, but Finsterforst add so much more of their own identity to the mix that it feels like even though they may still nurture the influence, they are working hard at outgrowing it. Rastlos maintains a definite black metal foundation, for burning guitars and excellent harsh vocals are the main style on display, but Finsterforst’s delivery maintains a very inviting slow to mid-pace push, allowing traditional/acoustic instruments (flute, a horn section, and accordion all make an appearance here) and the aforementioned synth lines to wash over the guitars and provide a warm early autumn atmosphere. When the pitch singing comes in, it feels even more mighty and never out of place. You can hear the bass guitar, which is such an often overlooked element when it comes to all extreme metal genres. The Bass somehow adds so much more depth when you can hear distinct lines that stand out from the main riff. ~ by martyworm on October 16, 2012. This entry was posted on October 16, 2012 at 5:51 pm and is filed under ALL REVIEWS, F-reviews.You can follow any responses to this entry through the RSS 2.0 feed.You can leave a response, or trackback from your own site.